The Center for Task Force Training (CenTF) Program strives to increase the effectiveness of local, state, and tribal law enforcement in the management of multijurisdictional task force operations by helping commanders and other leaders make appropriate decisions regarding the administrative and operational issues that affect multijurisdictional task force operations in today’s world. In order to achieve this and to ensure that task forces maintain a strategic focus and operate with sound business practices that promote accountability and integrity, CenTF has developed an enhanced Task Force Commanders Training curriculum that aims to address accountability and performance measurement, ethical and impartial policing, and evidence-based practices designed to facilitate effective, efficient management of law enforcement resources. Training is provided both in a classroom setting and online, through the Center for Task Force Leadership and Integrity (CTFLI) Web site, at no cost to the individual or the employing agencies. Recognizing that task forces are a proven and effective means to bring together the expertise and resources of various law enforcement and prosecutorial agencies to combat complex public safety issues, the Bureau of Justice Assistance (BJA) has provided for the development and delivery of task force management and command training since 1991 through the CenTF Program. The CenTF Program has successfully conducted over 430 classroom-based training events, training more than 26,000 members of the law enforcement community on behalf of BJA. 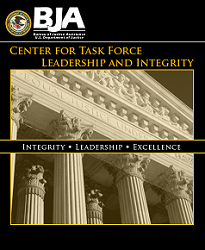 In response to the demand for task force training, CTFLI was developed by CenTF in 2009, on behalf of BJA, to provide training in a self-paced, online environment in order to make task force training more readily available to vetted law enforcement professionals. CTFLI provides practical exercises that cover both administrative and operational aspects of task force enforcement efforts, promoting leadership, integrity, and accountability while emphasizing best practices to reduce liability and enhance safety and effectiveness in task force enforcement operations. Since its inception, CTFLI has provided access to its online training to over 10,000 law enforcement professionals.